Widebody service will return to Wellington Airport this weekend with an all-New Zealand Super Rugby final prompting Air NZ to schedule a one-off Boeing 767-300ER flight to the nation’s capital to help fans get to the big game. 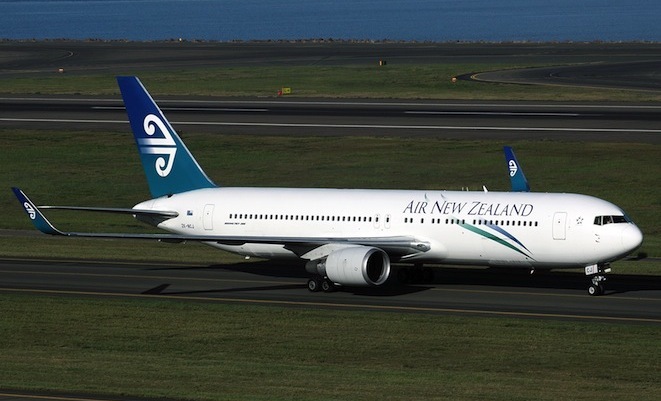 Air NZ said the 767 would add an extra 230 seats to Wellington in time for Saturday’s season decider between the Hurricanes and Highlanders and was one of several supplementary flights the airline has scheduled to meet demand. “This weekend is always a busy one for us as the school holidays get underway. With our domestic fleet fully committed our only option was to think big, utilising a 767 from our international fleet to get hundreds more supporters to the game,” Air NZ chief marketing and customer officer Mike Tod said in a statement. Schedules published by the Airline Route website showed Air NZ planned to operate the 767 on an Auckland-Dunedin-Wellington-Auckland routing on Saturday. While Wellington Airport does not receive regular widebody service, the airport has hosted a number of Qantas Boeing 747SP, 767s and Airbus A330s, Air NZ 777-200ERs (for relief flights after the Christchurch earthquakes) and 777-330ERs (demonstrations and flyovers) in previous years. And as journalist John Walton noted in the July edition of Australian Aviation, there have also been occasional foreign government aircraft such as A340s and Boeing 787s for official visits to the NZ capital. And a United 747-100 also diverted to the airport in 1991. The Hurricanes host the Dunedin-based Highlanders at Westpac Stadium in Wellington on Saturday night. Read more about Wellington Airport’s plans to extend its runway in the July edition of Australian Aviation, on sale now. Not an expert by any means but didnt know Boeing 767’s had winglets. Looks more like a Boeing 737-800NG in the photo. Hi Terry. Air New Zealand retrofitted the winglets to the 767 fleet sometime ago. They never rolled of the factory sporting them. Wonder how long the retro-fit cost of winglets takes to be realised in fuel savings? ..it doesn’t matter anyway, because the Hurricanes are going to win. Great reading about wide bodies into Wellington, but Dunedin has never has never had a wide body service and I cannot recall one ever flying into there but I am happy to be corrected. Re the winglets on the 767, Air NZ was one of the first airlines to do this along with some other efficiency modifications. (packs to remove moisture). The winglets and other modifications gave better fuel/performance improvements than planned hence probably why Air NZ has now brought the remaining 767’s. There is talk Air NZ will take out the business class seats in the 767’s and fit the new premium economy seats and sell them as premium economy to what is referred to as “fly and flop” destinations. Interesting to note that United is now putting winglets on some of their 767’s to retain them in the fleet while there is talk some of the ex Qantas 767’s are being refurbished, winglets fitted and leased to West Jet of Canada. I see on flight radar this morning 8am aest.That there are two Airnewzealand jets about to depart Auckland for Cairns at the same time,! x 767-300er and a A320.Is this a charter does anyone know..And there;s also a 747sp from Nasa working out of Christchurch for the last week or two? United would have struggled with a B747-100 into Wellington on a diversion. I recall Qantas, when it was an all 747 carrier, couldn’t get a full size jumbo (before the 747-8) into Wellington but the SP could do it. We hear Vail Resorts (USA) new owners of Perisher Valley Australia’s biggest ski resort, is looking for ways to get people to Perisher(for those who don’t live in SYD or CBR). No longer ANY commercial flights to OOM & both QF & VA have cut back on capacity into CBR on weekends. TT or JQ would be perfect, but VA & QF respectively won’t allow them into CBR. So maybe NZ should fly on or around weekends a 767-300ER with maximum seats in one class maybe AKL or CHC/PER, then do PER/CBR/BNE & back again. AFAIK, NZ can fly domestically in OZ without any restrictions & they could do it on a low cost basis. Makes a lot of sense really. Vail Resorts in USA underwrite certain % of seats into Vail airport which is far superior into flying into awful DEN, which is worse than SYD, if that’s possible. Better still NZ could fly a 767 from NZL to BNE, then do BNE/CBR/BNE & back to NZL. With fast turnarounds, could almost do it with one crew.